Still taken from Lonely Planet’s video review. Click photo to see Lonely Planet’s video. So if you’re looking for some thrills on your visit to Angkor Wat, this could be just the thing you are looking for. Maybe I’ll give it a try on my next visit. One of my favored activities when I am in Siem Reap is strolling around and hanging out at Wat Damnak. 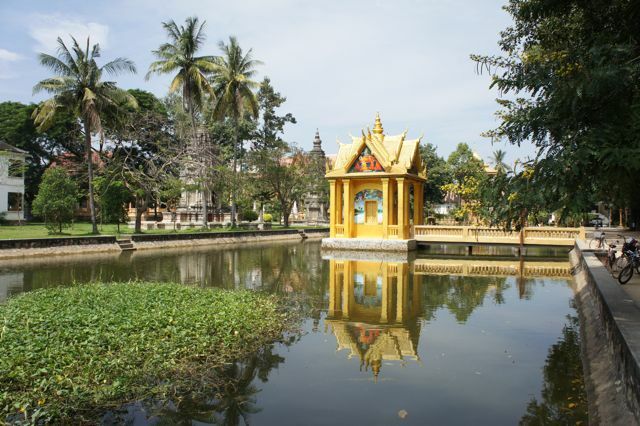 Its a large pagoda complex with all the ‘trimmings:’ an active pagoda, orange-robed monks, a large reflecting pool and numerous stupas. The grounds are also home to an elementary school which with Cambodian kids always offers many opportunities for some nice photos and a lot of laughs when you show the kids the pictures you have taken. In one corner of the compound is a burgundy and cream coloured building which is a drop in library. It’s well worth popping in to if you’re even remotely interested in Khmer history, including the history of Angkor. There is a fairly extensive library there which houses a host of books about the subject. You’re more than welcome to call in and browse through the collection – which includes many books in English and French as well as Khmer. I love the food in Cambodia! I’m no expert or even gourmet hobbyist (although I am very enthusiastic about eating) but I know what I like and I love a lot of Cambodian dishes. Just a couple days ago I stumbled across this article on CNNGo’s travel pages – “10 meals every visitor to Cambodia should try.” I’ve had a lot of the dishes on the list although not every one. My favorites are Amok, Bai sach chrouk (Pork and rice breakfast dish), Lap Khmer and Khmer curry. I’ve never tried Red tree ants with beef and holy basil but I love Cambodian beef and holy basil and I found the lemony taste of tree ants in Australia’s outback to be very nice so I think I’ll put this dish on my things to try on my next trip to Siem Reap. And don’t forget of course all the roadside grill food that you will come across and which is not mentioned in the article. 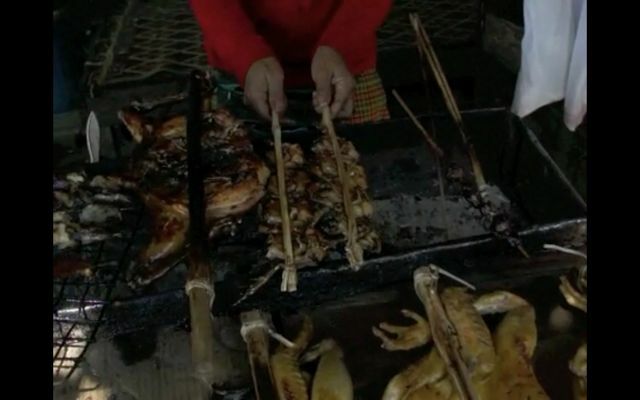 Many westerners will shy away from these roadside stalls with grill food but I can tell you the chicken and fish is really tasty and I have never had a stomach problem there. I have yet to taste the frog or occasional snake, bird or spiders but I hear tell it all tastes like chicken :)…. Ponheary Ly with some of the 2,000+ kits of school uniforms and supplies without which thousands of poor Cambodian children would not be able to attend school. Actually I have many heroes in Siem Reap. There are so many people there doing selfless work and amazing things for their fellow human beings. And I have so many Cambodian friends who are just living a life that we could not even imagine, a life facing great challenges and almost against all odds, a life where they nevertheless manifest great love and compassion in the world. These too are heroes for me who give me such energy and inspiration each time I visit. But I never tire of telling people or writing about Ponheary Ly who was among her other achievements a CNN Hero finalist in 2010. One of my most soulful and emotional days in Siem Reap was going with Ponheary to the opening day of Wat Bo school where the Ponheary Ly Foundation supports hundreds of very poor school children with the school supplies and other bits and bobs they need to stay in school. My thoughts on that day were encapsulated in an article I wrote after an interview with Ponheary. The title – Education is the Sweetest Revenge – pretty much summed up the life’s mission this stalwart woman has given herself. One of the other most soulful and moving days I have spent in Siem Reap, perhaps in my life, was again with Ponheary and some of the other amazing folks from the Ponheary Ly Foundation when I had the immense privilege to truck a nutritious hot lunch 3 hours north of Siem Reap to the most amazing school the foundation runs in the terribly challenging village of Koh Ker. At the age of 14, Ponheary Ly died and came back to life. At least, that’s how she describes it. The year was 1977, and the Khmer Rouge was on its deadly rampage in Cambodia. After seeing her father killed, along with 13 other family members, Ly was on the run and in hiding when some soldiers accused her of stealing food. They marched her deep into the woods and forced her to dig her own grave. I encourage you to read the full article. I’ll be very surprised if Ponheary doesn’t become one of your heroes too. Here’s a nice recent travelogue article – “Visiting the 900-year-old temple Beng Mealea in Cambodia” – about one traveler’s day visiting this mysterious jungle temple. Its referred to the jungle temple because it lies largely unrestored in the jungle. Once hardly visited it is now a bit unfortunately more and more often on the bus tour group route and the now paved road is more inviting to individual tourists as well. It is still well worth the time and cost to visit. Late afternoon is one of the best times to visit since by then the tour groups have left. And if you are traveling with children or teens, Beng Mealea is the best place for them to feel Indiana Jones, while Ta Prohm is the best temple to feel like Lara Croft from Tomb Raider. A trip out here with Savuth and his tuk tuk costs $35 and can be combined with a visit to the temples of the Rolous Group which are on the way. 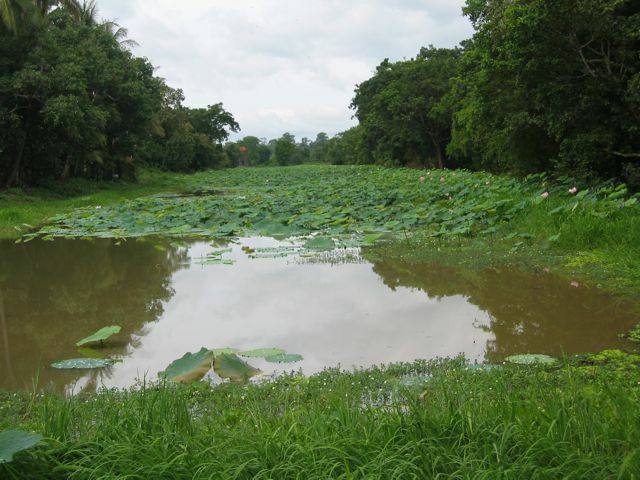 For $40 you can also have a great day combining Beng Mealea and Rolous with one of the stilted villages on the great lake Tonle Sap, either Kompong Phluk or Kompong Khleang. These beautiful statues leading to the gates of Angkor Thom have almost all been beheaded by looters. Hopefully some of these will also be recovered one day. The destruction of so many parts of the temples and other artifacts like the statues leading to the gates of Angor Thom has been terrible over the years. So this news is so fantastic. Let’s hope that a lot of artifacts find their way back to their rightful and proud home! I am often asked by friends, acquaintances and website visitors if they should or need to hire a guide and if my friend Savuth or his driver mates are guides. Let me share my thoughts on this question by giving some background on how the driver and guide system works in Siem Reap, by outlining some of the possible pro’s and con’s of guide or no guide and by giving you several sources of good and unusual information for the do-it-yourself guest. First a small bit of background. In Siem Reap, you have drivers and guides. Guides do not drive and drivers are not allowed to enter the temples with their guests. A driver has an amazing amount of local knowledge, can put together a great touring itinerary, make suggestions of things to do, knows where its good to eat while out touring and can be one’s ‘man about town’ when it comes to arranging things or taking care of needs that come up during your stay. They know something about the temples but do not have in-depth knowledge about the temples. A guide has completed a rigourous study to gain in-depth knowledge of the temples and everything about them. If one wants a guide, then one will need to hire and pay for both a guide and a driver. One can engage a guide and he or she will arrange and charge for the transportation. Or one can engage a driver and he will arrange a guide out of his network to accompany the guests. In both cases, once again, the guest will pay for both the transportation and the guide. The vast majority of people do not use a guide but there is absolutely no right or wrong answer to this question. It really is a matter of personal style. Some pre-travel research and a good guide book is generally sufficient in my opinion and from my experience. However, that’s me. Each person will crave a varying level of detail when visiting these wonders and each person will have a different style of preparing for such a trip. Some people will love the in-depth running commentary that a guide provides, getting to know a lot of detail that may otherwise be missed in terms of the meaning and evolution of the rich imagery and architectural motiefs that characterize the temples as well as some background and historical details. But again, with some pre-trip research and a good guide book in tow, one can do most of this on one’s own. I highly recommend exploring the amazing multi-media special coverage of the ancient Angkor empire from Nat Geo. 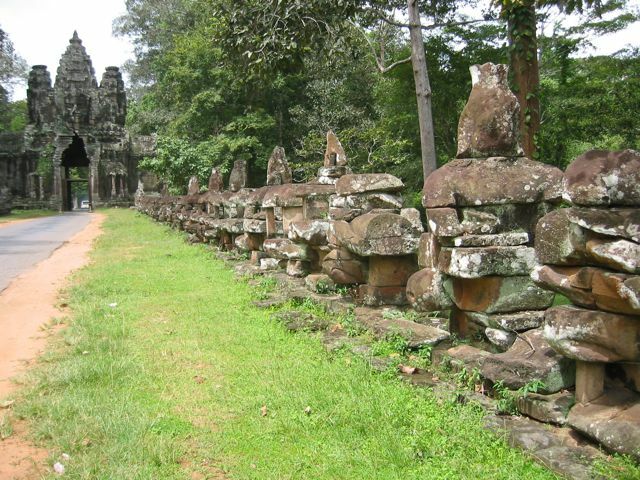 It provides some wonderful context to what the temples actually are and the role they played in the powerful and very technologically advanced ancient Angkor empire. It is fascinating stuff and really brought the place to life for me on my subsequent visits. This is where I encourage every Angkor visitor to begin their research, whether you will be hiring a guide or not. If you only want to read one thing before you go, then this would be it in my opinion. In terms of guidebooks here is what I have learned: You can check out Lonely Planet’s ‘Temples of Angkor‘ which is a 21-page downloadable guide for about $5. It offers good detail without getting too detailed. This is my favorite and what I take with me every year. If you want to know everything there is to know, you can download a massive and free guide from Maurice Glaize who in 1944 wrote the definitive guide to the temples. You can also check out a nice audio tour (with corresponding maps) that everyone in the family can put onto their Ipod or MP3 player. It covers several of the major temples and is similar to the audio tours that most museums offer using a numbered route corresponding to the tracks. As interesting background reading, you can also download ‘Time, Space and Astronomy at Angkor Wat’ that looks at the often overlooked aspects of the cosmology and astronomy of the temple Angkor Wat. Oh, have an I-Phone? 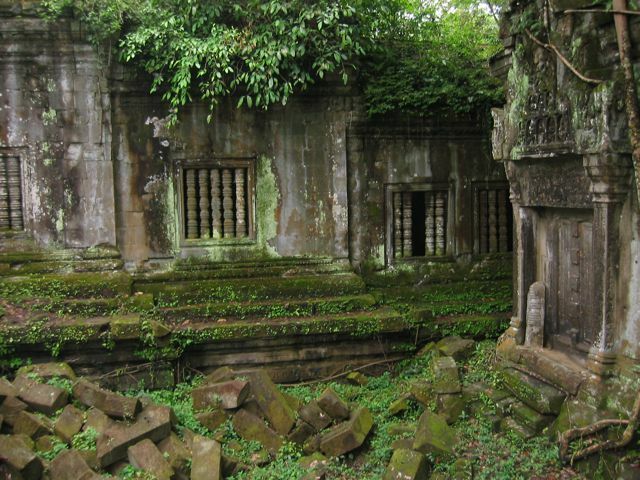 Check out Travelfish’s Angkor guide app for the Iphone. Unfortunately, as of this writing, Travelfish hasn’t yet made a version for Android.